After getting my tickets for the onward journey to Kerala, I was busy searching for return tickets. Cold response from one contact ticked him off from my list. My second contact would’ve succeeded in getting a confirmed ticket - but decided to give him a break as well. I checked for tickets on the websites of some operators - none of them had tickets. RedBus showed up some really expensive options. I changed my strategy a bit and searched for tickets from Coimbatore - Bingo! All buses had enough tickets. Choosing Hindusthan Travels for this journey was a no-brainer - since I’ve never tried this operator, and have heard good opinion about their service. I booked the ticket through their website. Their fare was Rs. 10 less than KPN. The website looked like a page put up by an amateur. The layout was simple, but lacked professionalism. After the ticket got booked, instead of heading to the e-ticket printout page, I got logged off from the website. I was confused if my ticket got booked or I lost my money. I received an e-mail with a copy of the ticket in it. I played around the website, and found out that I could take printouts by visiting “My Account”. It was all in all a confusing experience. Thankfully the payment went through without a glitch. After getting a confirmed Coimbatore-Bangalore ticket (departing Coimbatore at 2300hrs), I was now searching for a Thrissur-Coimbatore ticket. 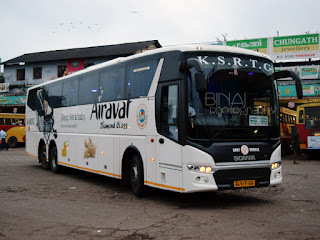 Kallada had two buses at that time - but none of them showed reservation availability. One of the two buses had enough seats, but It wouldn’t let me book from Thrissur to Coimbatore. I was ready to pay for an Ernakulam-Coimbatore ticket, but with boarding from Thrissur - a guy at Kallada’s office in Thrissur rudely replied that it wasn’t possible. I now decided to take a KeSRTC bus, no matter what. After a bit of struggle, I managed to get an autorickshaw to get to KSRTC bus station. 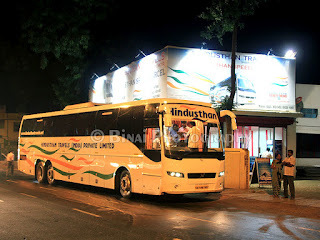 During my chit-chat with the driver, I came to know that buses from Kodungallur side are not permitted to go towards Thrissur round during evening hours. He was cursing the municipal corporation for their disinterest in maintaining city roads and was blaming the traffic cops for the traffic fiasco. After wading through heavy traffic, the driver dropped me near the entry of KSRTC bus station. 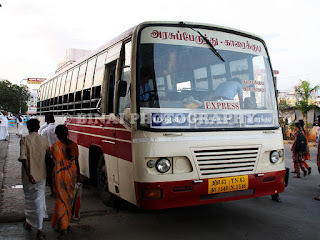 As I entered the bus station, I spotted a TNSTC bus heading to Coimbatore – but I wasn’t very interested in sitting that long in a TN bus (they crawl slower than a tortoise). I headed straight to the enquiry counter – the person sitting there said one bus was expected soon, but suggested that it would be safer to take a Palakkad bus and change over there. I decided to do as suggested. There were no Palakkad buses at the bus station at that time. Around 1745, a tired looking Leyland bus of Vadakkenchery (TP934) came in. I hovered around the bus, and was delighted to know it was heading to Palakkad – managed to get into the front seat and made myself comfortable. Around 1750, a Superfast heading to Coimbatore came – it was already crowded. I decided to stick to the Palakkad TT itself. An FP to Palakkad too came in – but it was a risk getting off my bus – the risk of losing my seat. My bus started moving at 1757hrs. I was slightly worried since it takes 2hrs for a TT bus to travel from Thrissur to Palakkad – that meant an arrival around 2000hrs at Palakkad. I didn’t have any choice but to continue in the bus. The bus was crowded beyond capacity – the engine, though sounding tired, pulled through effortlessly. The road upto Mannuthy was in decent shape – beyond that there wasn’t any road for me to describe its condition. The bus was rattling off to glory – no point blaming the maintenance, since it runs through inexistent roads throughout the day. The run was eventless – there were a couple of traffic snarls on the way. We crossed Vadakkenchery at 1920hrs. Time was running out – I was getting worried as time went past. We finally made it to Palakkad bus station at 2022hrs – 2hours and 25 minutes for the distance. The running time was decent considering the bad shape of roads. Just as I got off the bus, I spotted RAE791 of Palakkad heading to Coimbatore. Waved at the driver, and he stopped for me. I got into the bus – which was half empty. Finally, started from Palakkad BS at 2023hrs. That was perhaps my quickest bus change! The road was in average condition. I was praying that there be no block at Walayar – my prayers were answered. It rained heavily though, as we crossed the border. The driver picked up speed after we crossed the border. The engine sounded very different (this was a 12M bus), and had excellent pickup. We overtook that Thrissur-Coimbatore TNSTC bus just after Madukkarai – this bus had left close to 30 minutes before I started from Thrissur! I was glad my decision wasn’t wrong. I was dropped at Ukkadam BS at 2153hrs. It took exactly 1hour 30 minutes for Palakkad-Coimbatore. Thrissur to Coimbatore was 3hours 55 minutes (and 5 hours 05 minutes for home to Coimbatore – travelling time alone). The running time was longer than average. I headed to a small hotel outside Ukkadam BS for my dinner. After dinner, I took an auto from Ukkadam, straight to Hindusthan Travels’ office near Nava India bus stop on Avinashi Road. I had selected this boarding point to check out the lounge of Hindusthan Travels. I reached there at 2230hrs. (The auto charged Rs. 130 – not bad considering the time and distance). I showed the ticket – the guy at the counter said the bus would come at 2300hrs, and requested me to wait. Headed out to use the toilet – the toilet was in shambles – quite a disgrace for the plush waiting lounge they had! I checked out the complimentary Wi-Fi they offered and caught up with mails. The lounge was airconditioned, and they were playing some satellite TV channel on the LCD screen. The bus came in at 2246hrs – it comes after picking up passengers from Omni bus station. Boarding commenced immediately. A checker stood near the door and checked tickets before passengers got on board. The bus was fresh inside – it was clean and well kept. 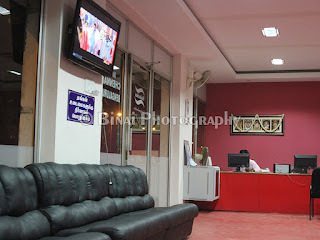 The interiors had a red tone – their waiting lounge also had red coloured walls and red furniture. They were playing some old Tamil songs (FM Radio) in the bus. I had a window seat towards the middle of the bus – seat #14. My co-passenger also got in from Nava India. Settling accounts and tallying the ticket list took some time – there was one driver and one attendant in the bus. One passenger requested if he could use the driver berth (At the rear end) – the attendant readily allowed. A quick headcount was done – 38 passengers were on board. 4 more would board at Hopes College. We started off at 2258hrs – 2 minutes before time. KA-01-AB-2952. My bus to Bangalore. We stopped at Hopes College pick-up point at 2301hrs. The passengers were already at the pick-up point. They got in – but there was some confusion, and we kept waiting. Finally, the bus started moving at 2307hrs (Still before time). The lights were still on, and the FM station was still playing. The attendant came around to distribute shawls and later with 500ml water bottles. I slept off soon after the bus hit the highway – I vaguely remember seeing the bus passing Chengampalli toll gate. I slept through the journey – was woken up when the bus stopped for a break somewhere near Thoppur/Dharmapuri. The attendant switched on the lights and disturbed everyone – but nobody got off. I did not get up either. I slept off even before the bus started from the break. I was woken up when the attendant switched on the light again – this time at Hosur. I was shocked to see that it was just 4AM! We were about an hour early! A passenger or two got off, and the bus continued. I woke up again as the lights were switched on, again. This time the attendant was shouting “Electronic City” – the time was 0427hrs. Some 5-6 passengers got off here. I pulled up my seat and kept the shawl aside, preparing to get off. The bus took the elevated highway and flew through. I got off my seat and headed to the cabin – the lights were still on, and most passengers were seen pulling their shawls over the face in an attempt to keep sleeping. The bus stopped at Silk Board at 0436hrs – close to 1hour and 30 minutes before their scheduled arrival time of 6AM! I am thoroughly impressed with the service – but not with the unearthly arrival time. Auto drivers at Silkboard robbed me of Rs. 250 for the 7km ride home (I had no choice – it was too early in the morning for me to look for other options). The Coimbatore-Bangalore run took only 5 hours 38 minutes. The travelling time from Home to Silkboard was only 10 hours and 43 minutes – not really bad since the direct bus takes close to 12hours! 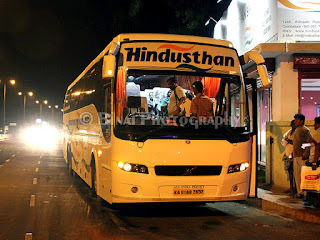 Comments: Hindusthan Travels is a Coimbatore based operator, who commenced operations in April 2012. They have successfully carved a niche market of their own – they’ve won over quite some loyal customers from other operators. The waiting lounge at Coimbatore was just awesome – I only hope they continue their class of service even as they expand their services to more routes. This bus was really well kept. I couldn’t see the odometer, but guess the mileage to be around a lakh-and-a-half kms. The service was warm – except the attendant having a fetish of switching on the passenger cabin lights every now and then. I wrote to Hindusthan about this, and was pleasantly surprised to get their reply about sensitising the crew regarding this. They supplied water bottles – which I feel is unnecessary for such a short overnight trip. They could reduce the plastic burden by avoiding this. Shawls were good in length, but were narrow. I am really impressed with their service – would surely try them again. Will I take this service again: Surely. 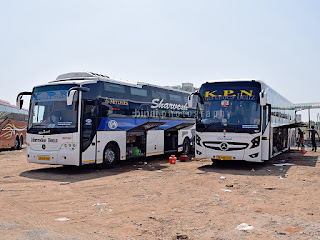 Just that I don’t travel Coimbatore-Bangalore very often and changing too many buses to reach Coimbatore from my hometown is a tiring job. I only hope Hindusthan enters the Kerala market soon. And Whats the fare from CBE to BNG??? Rs. 665 for CBE-BNG. And, its unfair to compare a bus that takes the bypass, to a short distance buses - short distance buses tend to go slow, since they need to provide comfortable arrival times even when departing at comfortable times and also focus more on mileage to cut operating costs.